As a fan of cinema I have always anticipated an interesting point of view from Michelangelo Antonioni. 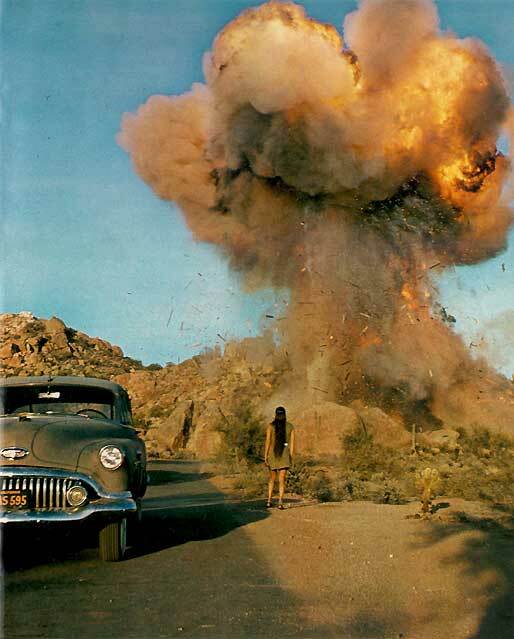 And “Zabriskie point” does deliver that. Although in its own time it did not receive positive reviews, it became a classical movie and a symbolic representation of a whole cultural and historic era of struggle against the imposed artificial values of society. Every decade has its own significant symbols. And the years of the 1960s were a major turning point in our modern view of life. The scenes from the bubbling city and the still Zabriskie point at the Death Valley (which in fact was represented as an alive place where the feeling of seclusion is transformed into a “fertile” place where love peace and happiness prevail. The powerful imagery soaked into this film convinces the viewer that there is something wrong with the human nature of constant exploitation of every possible resource. And the most important resource which are we still expropriating is the human empathy. Exactly empathy is what is missing in the city where Mark revolts against the authorities and status quo. On the other hand Daria is a free loving wayward character who is traveling through the desert. And when the two meet we can see a storm of playful emotions arising. The political context and the cultural clashes of various social movements are colorfully represented in the conversations between the main characters. The paths of the two strangers are different, but they intersect to show us that everything happens for a reason. And the two main characters part their ways because the real life also works in such impossible patterns. And at the end when the disillusioned Daria blows up mansions and consumerist products with her mind we can see the real energy of counterculture. The youth subculture seems potent as ever even from our point of view. And now we have to ask ourselves why do we have the same dissatisfied feeling as they did back there? And is it a bit different? My feeling is that we haven’t renounced the problems at all. We just changed the way we perceive them and postponed the decisions we have to take. Decisions which have to solve inequality and more importantly transform our egotism into something more transcendent as a quality. Death and Life should not be the main measures which we take into account when we treat our fellow humans and more importantly – our home, the Earth.